Sunday’s Super Bowl will be the second-straight season where two players who were waived by the Houston Texans have gotten the chance to play for a championship. Last season it was receiver Jacoby Jones, who returned a kickoff for a touchdown helping the Ravens beat the 49ers in New Orleans in Super Bowl XLVII. 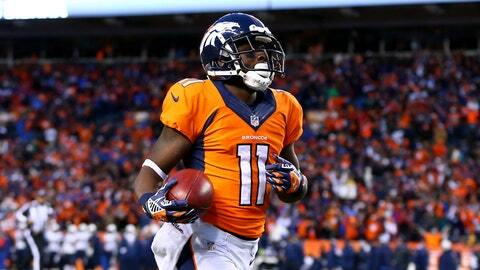 Now, ex-Texan Trindon Holliday is getting his chance to make a difference in Super Bowl XLVIII with the Denver Broncos. While playing in a Super Bowl instead of waiting anxiously for May to see who your team takes with No. 1 overall pick in the NFL Draft seems like the better end of the deal for Holiday, he still feels like he has something to prove to the Texans who released him halfway through the 2012 season. "You always have a chip on your shoulder when you get released or cut from the team," Holliday told the Houston Chronicle. "You shouldn’t show it. You just have to prove to the guys that you’re able to do it." Despite a lackluster, short career in Houston, Holliday took the opportunity for a fresh start in Denver finishing the season on a strong note, even becoming the first player in NFL history to return a punt and a kickoff for a touchdown in a postseason game during the Broncos’ double overtime loss to the eventual Super Bowl champ Ravens. "I don’t think it’s a rebirth," Holliday said. "I think it’s just coming to another team, just starting all over again."